You are here: Home / News / Blog / From the Teachers / Refer a friend and get rewards! Learning is a great way to meet new people, but learning with friends can be a quicker route to success! Here are three reasons why we think you should bring your friends with you to KSTVS. If you learn alone, it’s easy to take a break and can be tempting to quit. When you learn with a friend, you can motivate each other and keep each other’s energy and enthusiasm high. Learning as part of a group is fun, especially when your friends are involved! You can share ideas, find new ways of looking at things, and share some jokes at the same time. Conversation is better with two or more people! Practise makes perfect, so talking with your friends and having fun using all the new things you learn will help you progress quicker. 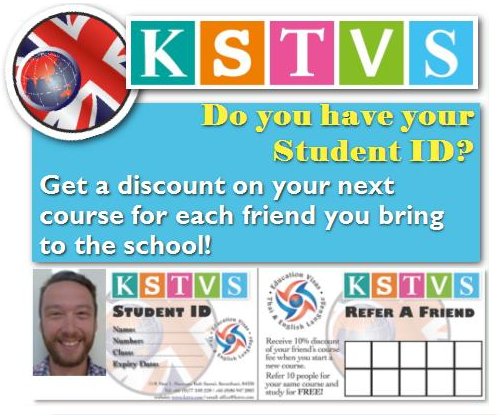 We would like to thank you for being our students by giving you 10% discount on your next course if you refer a friend! The more friends you refer, the more rewards we will give you. 10 friends = A FREE COURSE! All you need to do is bring your friend and your ID so we can sign them up and stamp your reward card!